Wamud Namok was universally known in life as Lofty. This tall, gentle man first engaged with the white invader when he was about 16 in 1942 – walking 200 kms from his West Arnhemland Stone Country home to work in a newly opened tin mine; later he would do war work and stock work before being encouraged to paint by a missionary. This would lead to an AO – one of only two NT Aborigines to be so honoured. But Namok was also the last of the rock artists of his Mok clan, resident every dry season in the remote Gapulwarnmyo, where he nurtured his tribal land, educated his grandchildren and won for his descendants the title of Indigenous Protected Area for the Upper Mann River. This declaration was a great step towards his vision of bringing his people back to care for their traditional lands. As recently as last August, this proud Kunwinjku travelled to the far east of Arnhemland to address the Garma Festival on his passion for the importance of outstations like his own in the cultural and artistic life of Aboriginal Australia. It was not a message that Federal Minister Macklin bothered to stay and hear. As an artist, Namok had already made his cross-cultural mark when his work was chosen for a 40 cents stamp in 1982. He was selected for the National Aboriginal & Torres Strait Islander Art Awards in Darwin most years from 1984. 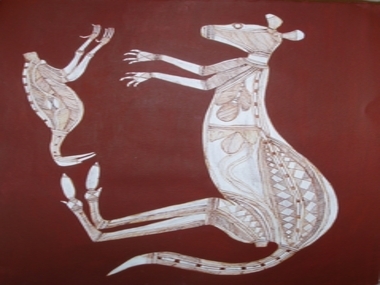 Many Australian encountered his work with the national tour of Rainbow Sugarbag and Moon in 1995 – a duet with Mick Kubarkku which revealed Namok's spirit and djang-laden life with his mastery of the X-ray style of painting animals such as the Black Wallaroo – Barrk – and Wak Wak the crow, keeper of his beloved Ankung Djang – the Sugarbag dreaming country. And then there are the rarrked spirit figures like Wakkewakken – a gender-free human form of the crow, playing an essential part in the Sugarbag cycle with its skeletal head and threatening tendency to bring rain or cause other forms of havoc. The delicate balance between naff and ceremonial dignity was one that Namok rarely crossed – as the National Gallery recognised by his thoroughly justified selection in the 2007 Triennial, 'Cultural Warriors'. In his senior years, Wamud Namok brought this sensitivity and years of experience together to work as a consultant to anthropologists, art historians, botanists and a diverse group of other researchers from both the social and natural sciences. He was also a regular speaker at regional land management conferences. “He has been extremely generous with his knowledge, teaching both non-Aboriginal people and younger generations of Aboriginal kin”, was the final judgement of the Warddeken Land Management organisation that was founded to carry on his pioneering work.